Here you will find information for existing members. If you are a potential new member, interesting in joining us, please click on CONTACT US and reach out. We are very friendly. Hold the date - Monday June 10th from 7.30pm. This will be our Society Annual General Meeting. This is an important AGM with key changes to our rules being voted in. Be there to make sure your voice and vote is heard. The AGM will be followed by an open forum, where we all get to discuss broader topics, ask questions, and help guide the future of the Society. 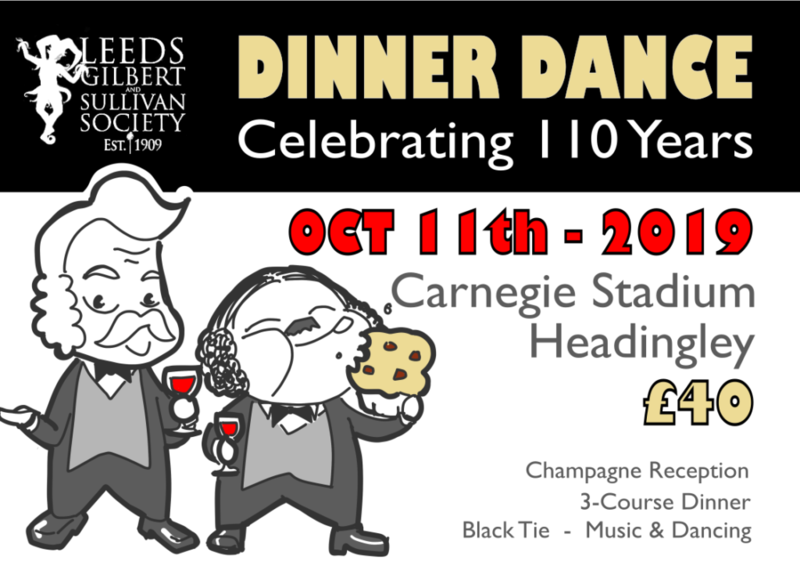 The big event this year is our Dinner & Dance in October, celebrating 110 Years of the Society. Click below to find out more. Phil Case is our charming Social Leader, making sure we get together for formal and informal fun beyond the singing and acting and dancing. He has a diary of events for the coming 12 months. Sunday 28th April - BAND CALL - 1pm to 4pm at the theatre. Make sure you have all those you are called for in your diaries. Act 2 Scene 4 inc Sue Me. Putting on a full production, whether a G&S classic, or a piece of modern musical theatre, involves many costs. To support this we have a membership subscription and show fee. For the main details, click below.